Live data updated every 60 seconds (requires JAVA). Cell ID I-5581 detected at 10:25 AM from 357.2° at a distance of 13 miles. Storm is weak and steady. 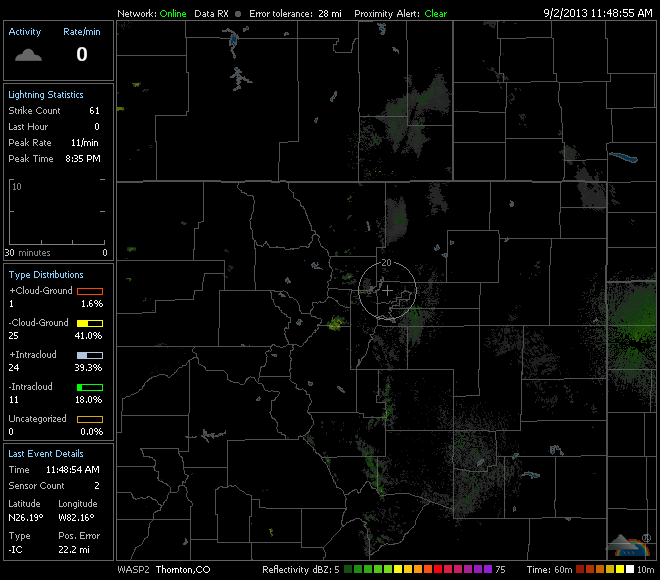 Cell ID E-5582 detected at 10:25 AM from 180.6° at a distance of 11 miles. Storm is weak and weakening. WASP2 displays lightning strikes with superimposed NEXRAD radar data. The strikes are only displayed if they are correlated with at least two other stations. In the Denver area, due to the limited number of stations available, this is difficult to accomplish so the number of strikes shown on the WASP display may be less than what is actually occurring.